The field of data visualisation appears to be the ‘Plat du Jour’ of recent. It continues to gain great popularity as more and more people recognise the value of visualising data of any nature in a more aesthetic form, be it as part of a narrative, a news-story or as standalone interactive piece. Indeed as an antidote to the constant information overload we encounter everyday it makes for a welcome alternative. 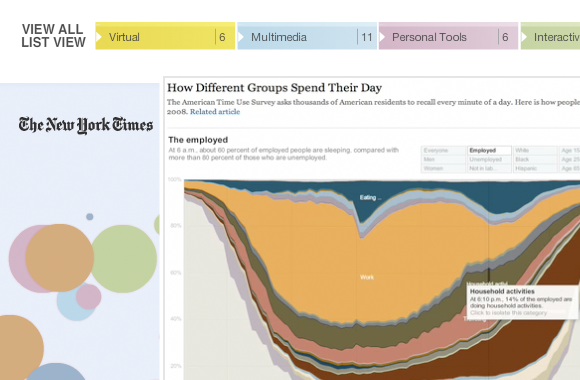 There’s a lot of amazing work going on in the field at the moment, and sites such as Flowing Data, information aesthetics, Visual Complexity, Data Visualization.ch and Information is Beautiful do an excellent job of covering the trends of what’s happening on the scene, and indeed whats on the horizon. However three pieces of work have caught my attention over the past number of weeks, which I’ll briefly describe in this post. They also share a common theme, in that they are either made about, made in or made by a person who lives in NYC. Perhaps a somewhat tenuous link, but one none the less. While the entire newspaper industry sits around debating whether the internet will bring about their demise and how they may avoid such a fate, The New York Times bucks the trend by embracing it. The work carried out by the inhouse team known as the Interactive Newsroom Technologies at ‘The Gray Lady’ has been making headlines of their own for quite a while now, and justifably so. Their combination of visualisation and data is leading the field in an emerging digital storytelling domain. Interactive Newsroom Technologies are the minds behind the online pieces which have captured the eyes and the attention of online readers, works such as their ‘Word Train ‘- a mood database which appeared on the home page for Election Day and ‘Casualities of War: Faces of the Dead’ and ambitious project which merged photography, databases, audio, and graphics – this project marked the date U.S. military fatalities in Iraq reached 3,000. Emily Nussbaum wrote an excellent piece ‘The New Journalism – Goosing the Gray Lady’ earlier this year which details how & why this team was put together, also examining some of the fruits of their labor. The recently launched The New York Times – Innovation Portfolio aims to showcase the work carried out by the team and is itself a excellent piece of interactive design work, incidentally it was carried out by the uber-talented Jon Dobrowski. The pieces are visually represented by color-coded bubbles under the categories Virtual, Multimedia, Personal Tools, Interactive Graphics, User-Submitted and Applications. They also provide some insight into user engagement by showing the actual page-views along with the average time spent with the feature. 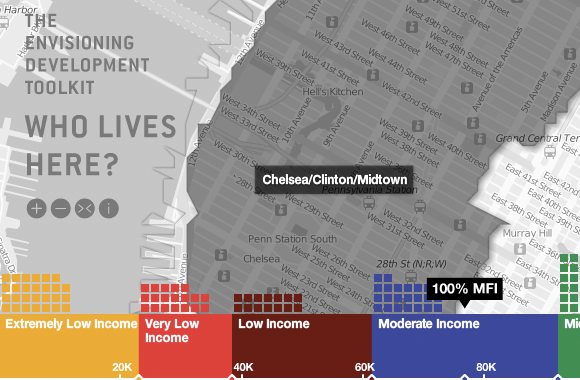 Next up is an interactive map I came across which shows the income & rent data by New York City neighborhoods. It poses the questions - Who lives here? Who can afford to live here? This visualisation stands out for me though, in that is is beautifully executed. It enables one to view income demographics and rents in the neighborhoods of New York City. When you click on particular neighbourhood, it maps the number of families in each income category on the multicolored bar residing at the foot of the interface. Web & Information design was carried out by by Sha Hwand, Zach Watson and William Wang with concept and project direction by Rosten Woo and John Mangier of The Center for Urban Pedagogy. As Tim O Reilly already pointed out this type of visualisation should be part of every city’s eGovernment toolkit, indeed every countrys. A highly functional yet simplistic visualisation that exposes the potential for applications as a means of explaining the numbers by way of the pictures. Anthropology + Mapping Application + Data Visualisation = Awesome. Check it out at http://envisioningdevelopment.net/map. I first stumbled across the work of Jonathan Harris back in 2005, which happended to be an interactive piece named Phylotaxis it aimed to be an expression of the space where science meets culture. He designed it in collaboration with the one and only Stefan Sagmeister and it was commisioned by SEED magazine who recently hired another guru, namely Ben Fry to head up their data visualisation group. Returning to Harris, his work aims to comibine elements of computer science, anthropology, visual art and storytelling, his projects range from building the world’s largest time capsule to documenting an Alaskan Eskimo whale hunt on the Arctic Ocean. Just released is a book which is based on the project, We Feel Fine: An Almanac of Human Emotion. With lush, colorful spreads devoted to 50 feelings, 13 cities, 10 topics, 6 holidays, 5 age groups, 4 weather conditions, and 2 genders, We Feel Fine explores our emotions from every angle, providing insights into and examples of each. Equal parts pop culture and psychology, computer science and conceptual art, sociology and storytelling, It is a radical experiment in mass authorship, merging the online and offline worlds to create an indispensable handbook for anyone interested in what it’s like to be human. Check out the interactive, installation and print versions of this amazing project at ‘We Feel Fine’. Zooming user interfaces or zoomable user interfaces (ZUI, pronounced zoo‐ee) are not exactly a new concept in the field of HCI/IXD. A ZUI could generally be defined as a graphical environment where users can change the scale of the viewed area in order to see more detail or less, and browse through different documents or objects. Despite all the work and research carried out in the space over the years the ZUI has had somewhat limited success. Indeed the finding of an effective and if you excuse the pun, scalable solution has proved somewhat elusive. That is not to say that ZUIs haven’t been effectively implemented in certain scenarios, indeed success stories such as Google Maps, Microsoft Labs Seadragon and Prezi have capitalised on the obvious benefits of effective applications of zoomable interfaces. The term itself was coined by one Franklin Servan‐Schreiber while working for the Sony Research Lab in partnership with Ben Bederson and Ken Perlin. One of the longest running efforts to create a ZUI has been the Pad++ project started by Ken Perlin, Jim Hollan, and Ben Bederson at New York University and continued at the University of New Mexico under Hollan’s direction. More recent ZUI efforts include Archy by the late Jef Raskin, and the simple ZUI of the Squeak Smalltalk programming environment and language. Bederson developed Jazz and later Piccolo at the University of Maryland, College Park, which is still actively being developed in Java and C#. ZUIs use zooming as the main metaphor for browsing through hyperlinked information. Objects are presented within a zoomed page or canvas and can in turn be zoomed themselves to reveal further detail, allowing for recursive nesting and an arbitrary level of zoom. A good introductory read is the late great Jef Raskins passage on ZoomWorld in his seminal HCI tome The Humane Interface: New Directions for Designing Interactive Systems, in which he discussed his idea of using the ZUI as a solution to the navigational dilemma for users. It’s also worth noting that he spent the latter stages of his career working on implementations of this new UI paradigm with his research team. The potential benefits of ZUIs are well-documented and as previously mentioned recent applications such as PREZI and Microsofts DeepZoom technology have nicely demonstrated certain use cases in which ZUIs are a viable and cognitively acceptable model. However the shortcomings are also well-documented with the most commonly cited bête noire being a phenomena commonly referred to as ‘Desert Fog’. This occurs when a person becomes disorientated whilst using a zoomable interface and loses track of where they are, which could be confusing for the user, which likely leads to frustration and ultimately results in the abandonment of whatever task it was they were trying to carry out. The user no longer has any on-screen landmarks or cues upon which to work out where they are. Unquestionably, this is a worse situation than most everyday/orthodox interfaces where at the very least a user can often infer the context of their operations by looking at what is on screen. With the presence of ‘desert fog’ within ZUIs, there is nothing on screen to aid this inference, and so a user is left in a proverbial ‘no-mans land’. Wayfaring, assistive navigational maps and various other interface features have been employed in order to address this undesirable scenario albeit with somewhat varying degrees of success. Perhaps seeking a singular solution is the incorrect approach, with the ZUI conundrum proving it could be a case of ‘One Size Fits Some’. Every now and then however a demonstration or an advancement in technology comes along which reignites the buzz for zoomable interfaces, yesterday I happened upon one of these demos which actually inspired me to write this little piece. At this years CESA Developers Conference in Japan Sony revealed an upcoming technology which will be available shortly as an SDK to developers for both the PS3 and the PSP. Sony have christened it High-Resolution Image Enlargement Technology, and despite the rather long-winded name it does not fail to impress. When I watched the demonstration video I was taken aback with the speed and ease at which the system was able to handle such resolution-intensive content. The video below showcases a number of the demonstrations – the main demo appears to be a release calendar which inside each entry, contains high-resolution photos or a video of whatever is being released that particular day. Make sure you stick around for the mosquito – it’s quite impressive. This is a genuinely astounding piece of technology that could well enable some pretty cool software applications, however the real selling-point for me is that is will be available on widely used consumer products. Perhaps the ‘desert fog’ may lift sooner than expected. To user interface & icon designers everywhere Susan Kare needs no introduction, it was she who designed the icons for the first Macintosh. Through her friend Andy Hertzfeld (a member of the original Mac team) she came to work at Apple after receiving a Ph.D. in fine art from New York University. In 1983 she joined the Macintosh software group and went on to create all of the original Mac’s icons and UI elements. From the ubiqutous trash bin, watch, pouring paint can and bomb icons to the portrait of a computer with a sly Mona Lisa smile, her work has graced desktops all across the world. Which brings us to the story of the ‘The Steve Icon’; one day way back in February 1983 Susan Kare was busy creating icons for the Finder. Those were simple icons, only 32 by 32 black or white pixels or 1024 dots in total. It was said Kare would also draw lots of other images as well, for either practice or just for fun, usually reflecting her somewhat playful sense of humor. Then in the spur of the moment she took it upon herself to start drawing a portrait of Steve Jobs – no small task within such a tiny space, but somehow Susan succeeded in crafting an instantly recognizable likeness with a mischevious grin that captured a lot of Steve’s personality. It was reported that Jobs himself approved of the icon. Before long other members of the Mac team came to Susan requesting that they too be forever immortalised in 32 by 32 pixels – it became a Mac team status symbol to be iconified. Kare left Apple around the same time as Jobs and went on to become the 10th employee at his new company NeXT – where she undertook the role of creative director. One of her first projects was to oversee the design of the NeXT logo for which she hired her idol the great Paul Rand. Nowadays as a freelance user interface graphic designer, she works for some of the biggest tech companies in the world including Electronic Arts, Facebook, IBM, Sony Pictures, Motorola and Microsoft. In recent interviews she has stated that over the past 10 years, she has drawn more than 2,000 icons. No mean feat – even for the lady who had a hand in making Steve Jobs an icon, in both a metaphorical and a literal sense.